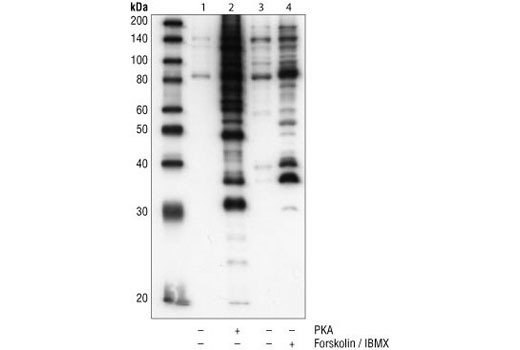 Monoclonal antibody is produced by immunizing animals with synthetic phospho-PKA substrate peptides . 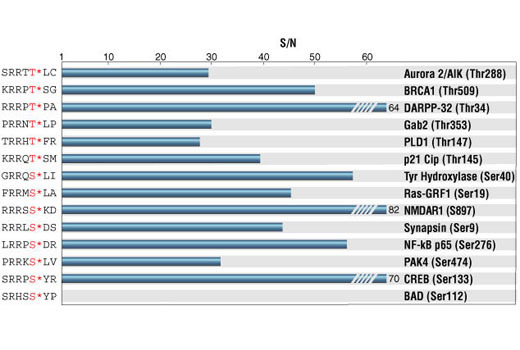 An important class of kinases, refered to as Arg-directed kinases or AGC-family kinases, includes cAMP-dependent protein kinase (PKA), cGMP-dependent protein kinase (PKG), protein kinase C, Akt and RSK. These kinases share a substrate specificity characterized by Arg at position -3 relative to the phosphorylated Ser or Thr (1,2). Phospho-PKA substrate-specific antibodies from Cell Signaling Technology are powerful tools for investigating the regulation of phosphorylation by PKA and other Arg-directed kinases, as well as for high throughput kinase drug discovery.